Note: This site contains a double building, adjoined since its construction in 1883, and under single ownership until 1967. For the first seven years after the fire, 1883-1890, it is sometimes difficult to determine whether a particular occupant was in the corner store or in the stores in the building adjoined to the south, but I have indicated the position of each store when known. 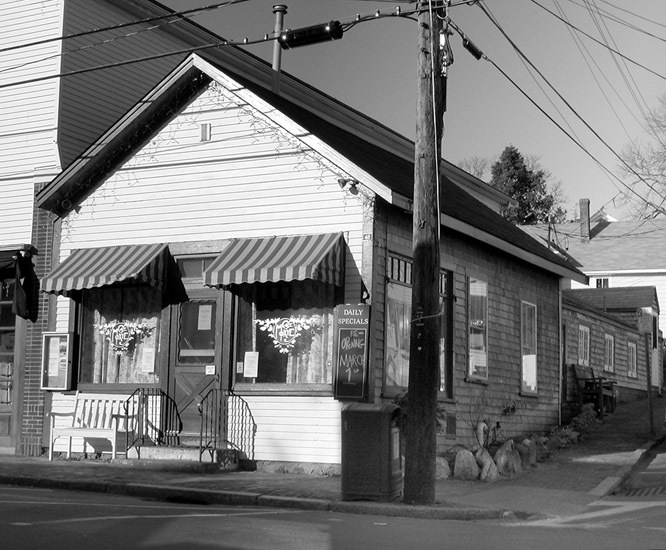 After 1890 the corner store occupants are known, so I have listed them separately in the second half of this web page. c. 1883-1890. Ben Dexter's double store is on the far left. The original building at this site was erected by Capt. Elisha Dexter (1800-1871) "whose eccentricities and sudden changes of lease, on the ocean and the land, were marked characteristics of the man, and whose exploits in whaling voyages as narrated by him in lectures were highly enjoyed by numerous audiences in the old times" according to one Gazette account. Elisha was a whaler who was at one time shipwrecked on the brig William and Joseph and who once owned a candy store in Honolulu. Elisha retired from whaling in the 1860s and opened an ice cream "saloon" on Spring Street. He was married to Eliza Merry (1802-1874), the daughter of Timothy and Elizabeth Merry, and they had one son Benjamin W. "Ben Chuck" Dexter (1830 -1907). The next occupant of this house was Eliza (Merry) Dexter's brother Capt. William Merry (1800-c.1856) who was lost in whaleship Undine in a typhoon in the Indian Ocean. Capt. Merry's widow, Mrs. Alice B. (Worth) Merry (1814-1891), was living in the house at the time of the 1883 fire. Her home caught fire about 10:30 the night of the blaze and was completely destroyed by the morning. At the date of the fire this was evidently also the home of Miss Jane Luce West (1823-1920), daughter of James Shaw West Jr. and Eleanora Daggett. She later boarded with her sister Eleanora on Woodlawn Ave., and still later with Ornan J. Slocum on Franklin St., where she died in 1920. Her obituary reads, "Those living in this town twenty or more years will remember often seeing an elderly, high bred little lady on her way to church, or out calling or for tea with a friend.This lady was Miss Jane Luce West... We well recollect her lady-like manner in particular, indicating as it did to even a casual passer, culture and refinement, and, also the typical school teacher of the older days who taught the highest and best morals and manners, not alone by precept, but by example. She was for over seventy years a member of the Methodist Episcopal Church of Tisbury." Jane grew up in Tisbury and remained a single woman, working as a seamstress and a school teacher. Stan Lair said: "[This] building was Ben Chuck's. Ben Dexter his actual name was, Benjamin Dexter - everyone called him `Ben Chuck.' He lived in the back of the building and did all of his wood carving there. The front was rented as a clothing store. Old Ben was famous for his crazy wood carving. Some of it still is around today - I have a few pieces here. I recall mounds of earth in the rear of that building with a full-size wooden Indian on each mound. I lived on Center Street, so I went right by there as a kid. I remember that wooden Indians out there. Frank Downs had a leather repair business in the front at one time. William S. Swift and Sons, surveyors, had their office there. Also the back room, after Ben Chuck, was rented to a Portuguese club. The young men would play cards there in the evenings, and had a good time." Benjamin W. "Ben Chuck" Dexter (1830 -1907) was the son of Capt. Elisha Dexter and Eliza Merry. The 1850 census calls Elisha a "mariner" and Ben a "trader." The 1860 census notes that Benjamin had a "confectionery store" and again calls his father a "mariner." 1865 census lists Elisha as a "confectioner" and Ben as a "painter." In 1870 both are listed as confectioners. In 1880, Ben was unemployed. The 1870 census also notes that Ben could not read or write, and the 1865 census records Ben as "deaf". Gratia Harrington, in her 1978 memoirs The Captain's Daughters recalled that "He was a short, thick-set man with bowed shoulders who had once been a whaler. In his youth he had scarlet fever, and it affected his speech so that only those who knew him well could understand him." In May 1881, the Gazette reported that Benjamin W. Dexter was refitting his Spring street "museum" and stocking his saloon with ice cream, and the following month Dexter opened his ice cream saloon for the season. He closed for the winter, and reopened in June 1882 with Miss Lydia G. Claghorn, attendant. In Nov 1882 it was reported that "A billiard saloon has been reopened in Mr. B. N. Dexter's store, Mr. William J. Look is in charge." The following week they reported that the new billiard room "is in `full blast.'" The billiard saloon closed the following month. Dexter reopened the ice cream saloon again in June 1883 with Miss Mae L. Downs, attendant. The fire of 1883 destroyed Dexter's Spring Street ice cream store and museum. The Gazette reported in 1933 that during the great fire Dexter "stood as the front door with as axe, keeping people away. Several boys, [George] Dean among them, ran around to the back and climbed in. They removed freezers of ice cream and some of the famous coconut cakes Ben Dexter was famous for, and served refreshments in a vacant shed to everyone who came along. "Anyhow," said Mr. Dean in narrating the incident, "we saved the cans, and that's more than Ben would have done." Ben was also known for his carvings of life-sized "grotesque human figures" which he placed around his shop. When the store burned down in 1883, people thought they were actual people burning alive. The Gazette noted that "Great was the lamentation when it was discovered that human figures were being burned in Ben Dexter's store. They turned out to be nothing but wooden Indians made by Ben, who was one of the most famous jack knife experts of all time." Dexter's destroyed ice cream saloon and "museum" were valued at $600. He had no insurance. 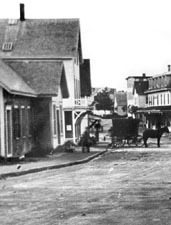 Nonetheless, the month after the fire the Gazette reported that he was negotiating to purchase lot on Main Street where Mrs. Alice B. Merry's residence stood. The property, jointly owned by the far-flung grandchildren of William and Alice Merry (including Dexter), was finally deeded to him in October 1883 for $800. 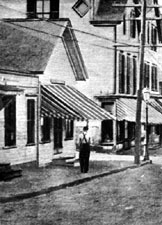 In November 1883 the Gazette reported that Dexter was building a store on lot he had recently purchased on Main Street where he was to carry on the ice cream business. He was still at work on the building the following April, and by June 1884, the Gazette reported that Dexter was fitting up his store on Main street for an ice cream saloon. Stan Lair said: "Ben Chuck, Ben Dexter, had a place in the rear of what is now the book store, the Bunch of Grapes Bookstore. Different building, but that's where he was located, and he did a lot of crazy wood carving, putting stuff through holes that seemed impossible. And no joints - and the holes were much smaller than the pieces he put through there, so it was always a mystery to people how he did it." SL: Ben Chuck his name is Ben Dexter. Before my day, but we heard about him. He's the one that did all this crazy wood carving. Like some that up above us here. Putting pieces of wood through an old bone, that the hole was much smaller than the wood that went through. So there's no joints there. BW: He had quite a talent for doing odd things in wood, didn't he? SL: Yeah, sure did. He built a few models, too, boat models. Pretty complicated things, but none of them were ever painted. I think there's one down at the Historical Society now. Anyway, his shop was right where Billy Andrews' barber shop used to be. What do they call it now? Popeye's Restaurant. In that block is where he operated from. Collection of wood carving by Ben "Chuck"
"Ben Chuck owned the piece of property that extends from the corner of Centre and Main to Yates' Drug Store and is now occupied by the Chowder Bar and the Bunch of Grapes Bookstore. The corner building has essentially the same shape it had in the eighties and nineties. The rest of the building was different. It used to be a long, low, shingled affair. In consisted mainly of a single long room. At one end of a shelf was a large beautiful model of a white steamship. At the other end was a model of a full-rigged ship. Ben Chuck rented this room out to the WCTU (the Women's Christian Temperance Union) ladies. The WCTU was a flourishing organization at that time. They used it for their meetings and also for a reading room and a game room for the young men of the town. 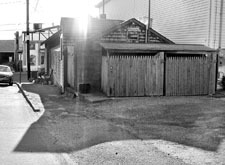 Behind the building was a lean-to; this was where Ben Chuck lived. They said he carved out a hole for himself and crawled into it at night. But Ben Chuck was a genius with a penknife. The steamer and the full-rigged ship were evidences of his talent. What interested us most, and was there in plain sight for all to see, was Ben Chuck's garden. And a most unusual garden it was. At the back of the building now used for a parking lot Ben Chuck had made five mounds, grassy mounds, which were flat on top. On each mound was a wooden statue he had carved with his penknife. I remember only that one was an Indian and another was a lady. They were beautifully carved and painted." After the fire, Dexter continued his wood carving and worked as a draftsman. He lived and worked in one room in the back of the Main street building. He was known as an eccentric oddball. Besides life-sized wooden Indians and model ships, he also carved animals, "grotesque whittled curios" such as a carved wooden cage with a carved wooden ball inside and his famous "won't-come-outs" which were impossible wooden puzzles such as a large wooden ball inside a narrow-necked glass bottle. The Gazette reported that "one learned man said that he believed Ben, through his puzzles, had unwittingly discovered the secret of the fourth dimension." 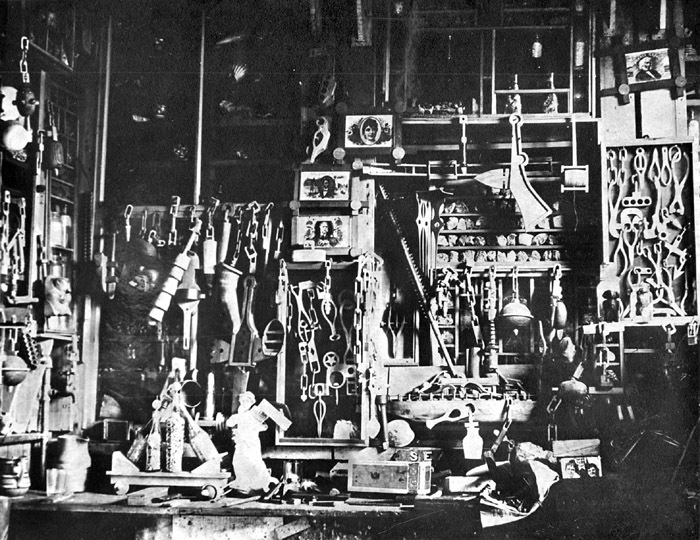 James "Jump Spark Jim" West acquired the bulk of Dexter's collection by 1932, which he displayed at his antique store at Five Corners, "The Shop of Unusual Things." The Barnacle Club also owned a collection of Dexter's impossible carvings. Today, Stuart Bangs is reputed to be the keeper of many of Dexter's impossible carving secrets. In March 1885, R. W. Coffin, who had recently returned to Vineyard Haven after a few years in Holliston (see Site #23), opened a grocery store in Dexter's building on Main Street. 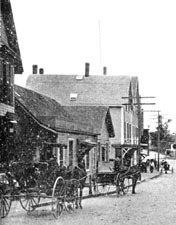 This grocery business also lasted only a matter of months at this location, as in April 1885 the Gazette reported that Coffin was moving a barn onto his own lot on Main Street which was to be converted into his grocery store, and in February 1886 that Coffin was occupying his new store on Main Street. (See Site #27.) This was evidently also a newspaper store, as it was recalled that Vincent's newspaper business across Center Street could trace its origins to this location. George H. Walker's 1887 bird's eye illustrated map of Vineyard Haven identifies this building as "F. E. Leach's Paint Store" Frank E. Leach had a successful sign painting business at this time, and in March 1886 the Gazette reported that he had opened a paint and paper store at this location. Frank E. Leach, the son of Dr. William Leach of Vineyard Haven, had previously worked as a druggist in his father's store in 1880. Sam Lee, who had managed a "Chinese Laundry" in Cottage City since 1880, evidently had a laundry business at this location in Vineyard Haven by November 1887. In April 1888 the Gazette reported that "Sam Lee has vacated Dexter's ice cream saloon, and it will be used as a club room by the "Republican Club" which was recently organized here." In May 1888 the Martha's Vineyard Herald reported that "Sam Lee, the Chinese laundryman, has moved his quarters from Dexter's to Lane's Block." The Herald reported in May 1888 that "The Republican Club has good quarters in Dexter's building"
and that it was open every evening. The Gazette noted the same month that the Republican Club had opened their rooms on Main Street for a reading room. The club remained here through the summer of 1888.
c. 1892-1899. Signs for the "W.C.T.U. 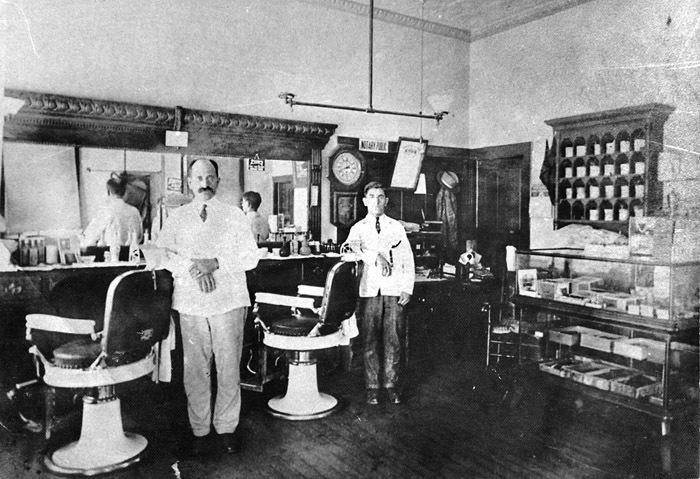 Reading Room," "Confectionery," and "Laundry" are all visible on the left, near the barber pole. In June 1886 it was reported that the ice cream saloon of Mr. Dexter on Main Street was opened to public by Herbert L. Tilton, who was to conduct the business, and in April 1887 they reported that Tilton had opened a line of fruit, confectionery and cigars at Dexter's store. In May 1888 the Gazette reported that the interior of H. L. Tilton's store had been painted by Frank E. Leach. "The color is a French gray, with counters and finish stained in cherry." 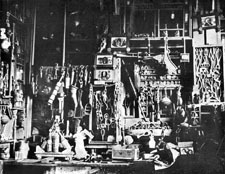 Meanwhile, Dexter continued his carvings in the workshop behind the store, and in April 1887 it was reported that two of Dexter's figures were sold: "Benjamin M. Dexter has sold, to a New Bedford party, two wooden images of what were made to represent human beings. These creatures are of large proportions and doubtless will attract attention wherever they are placed. It is thought, however that one look at their hideous outlines would be sufficient to impress a person with their grandeur(?)." In September 1888 the Gazette reported that "Howard M. Smith has bought out the business of H. L. Tilton, and occupies the same store, cor. Main and Center streets, owned by Benj. Dexter." The same month, the Martha's Vineyard Herald reported that "H. L. Tilton has sold out his store to Howard Smith who serves the public with anything in his line at the same stand." In May 1889, the Gazette reported that H. H. Smith had opened his ice cream saloon. This store was remembered as a candy shop with cigars and tobacco. 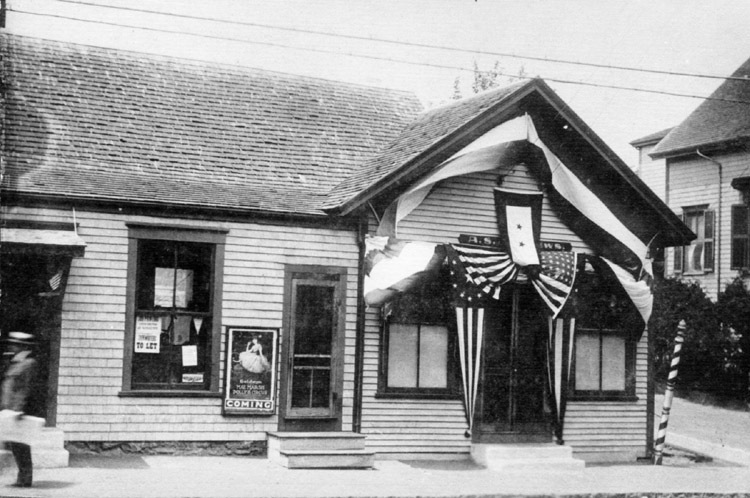 In May 1889 it was reported that flags were displayed between Norton's stable and Dexter's ice cream saloon. In Oct 1903, the Gazette reported that there had been a fire on the roof of Dexter's Main street building during a gale. There was a fear that the winds would spread the fire, but the volunteer bucket brigade was able to put it out. The paper reported that the building was occupied at that time by Timothy Shugrue, M. Madeiras, and Frank Golart. A 1953 Gazette article noted that the rear part of this building was a cobbler shop for many years run by Frank Golart and in part by his son George Golart who worked there as a boy. In April 1890 the WCTU leased a room on Main Street in Dexter's building for their meetings and as a reading room. They maintained a room here through the 1890s. The 1897 directory lists the WCTU Reading Room on the corner of Main and Centre, Mrs. Louise C. Tilton, President. Among many other causes, the WCTU were champions of street lighting on Main Street. In March 1887 the Gazette reported that "There are about thirty street lanterns maintained by individuals in this village without a cent of expense from the town. The village clock fund is sufficient (it is thought) to cover the necessary expense of repairs. New concrete has also been laid by private subscriptions." 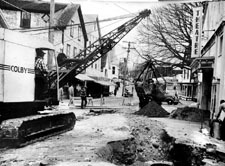 In August 1887 it was reported that the Village Improvement Society had recently put up six street lights and were helping fund the concreting of Spring St. from Main to William. In May 1892 the WCTU, now leading the cause to light the streets, voted to remove a lantern from Mr. J. Lambert's yard to the corner of Main and Spring streets, and to supply the post then standing on the corner of Main and Church streets with a lantern. They also privately organized the funding of a number of street lights, even after four street lamps were smashed by vandals in January 1893. In March the WCTU ended their street lighting program, and the call went up for the town to pick up the program. 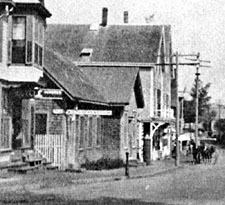 The town agreed, and in March 1893 the town voted to pay $100 for the ensuing year to light the streets of Vineyard Haven. The 1897 directory lists Benjamin Dexter as the lamplighter. By 1898 the town was paying $200 for street lighting, and in May 1898 it was reported that "Mr. Timothy Shugrue has taken the contract for supplying oil and seeing to the street lamps for the ensuing year." 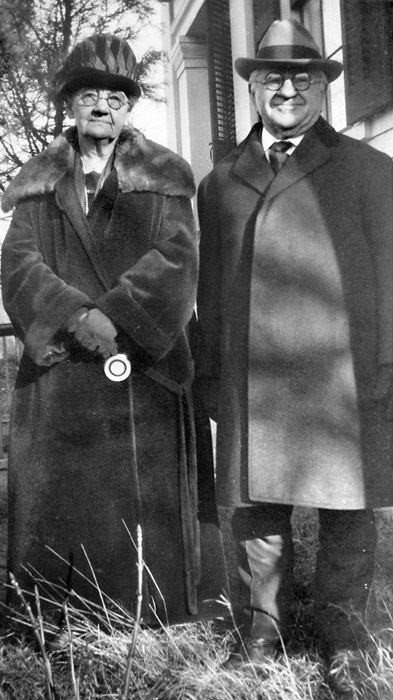 It is interesting to note the connections of both these men to the WCTU building the WCTU evidently remained influential in the town street lighting even after the town began to fund their program. The April 1900 census lists Timothy Shugrue as an "oil peddler." 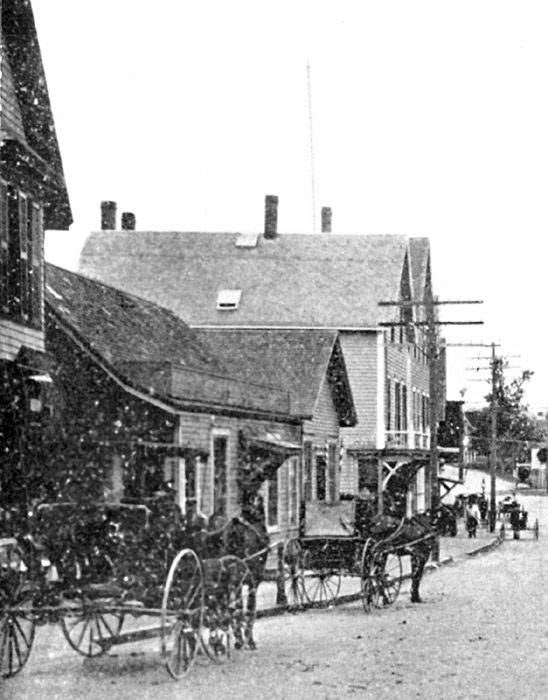 By 1907 Tisbury was paying $475 annually to light the streets, and in August 1912 Spring Street was poled and electrically lighted. In November 1895 the Gazette reported that Mrs. Beetle was opening millinery parlors in the WCTU Rooms on Main St for the winter. The 1897 directory lists Mrs. Eunice R. (Lambert) Beetle (c.1825-1914), widow of Tisbury farmer Richard Beetle (c.1802-1886), a "milliner" on the corner of Main and Centre streets. In July 1896 it was reported that John Revel (-1918) was opening an ice cream saloon in the WCTU rooms for the season. By 1910 his business was on South Main Street, and after his death his widow Mrs. Hannah Revel ran an ice cream business at that location for many years. In April 1900 the Gazette reported that A. Adelson had a store in the room formerly occupied by the WCTU offering jewelry, watches, clocks, and musical boxes cleaning and repair. In November 1902 the Gazette reported that "Mr. Timothy Shagrue has moved his stock of goods to the store of Mr. Benjamin Dexter." and elsewhere that "Mr. T. Shugrue has removed his harness business to the spacious shop of Mr. B. Dexter." Timothy Shugrue (1862-1907) had been listed in the 1880 census as a harness maker and in the 1900 census as an "oil peddler." He had previously managed a Main Street clothing store (see Site #23.) In February 1903 Bodfish & Call bought Shugrue's former laundry business. Shugrue was at this site as late as October 1903. Shugrue died in May, 1907. In November 1895 Benjamin Dexter sold this property to the Swift Brothers, Holmes A. Swift and William S. Swift, and the same day they leased for life the same property to Dexter. The following month, in December 1895, the Swift brothers sold the same lot back to Dexter. It's unclear what this transaction was about. Dexter appears in the April 1900 census, aged 70, with no occupation listed. In February 1906 Dexter again sold the lot to Joseph A. Merry with the addition of all of his personal property in the building. In return, Merry agreed to furnish Dexter with a "comfortable home," "suitable clothing," medical care, and a proper burial and gravestone after his death. Dexter died in 1907. Franklin Gray "Frank" Downs (1848-1934) was the son of Capt. Constant C. Downs (c.1807 1891) and Rebecca D. Luce (1809-1892) of North Tisbury. As a young man Downs learned the harness-making trade in Vineyard Haven and then opened a harness-making shop in North Tisbury. He was called a "harness maker" in the 1880 census, a North Tisbury "farmer" in a 1889 town record, and the 1897 directory of North Tisbury lists him as a "laborer." 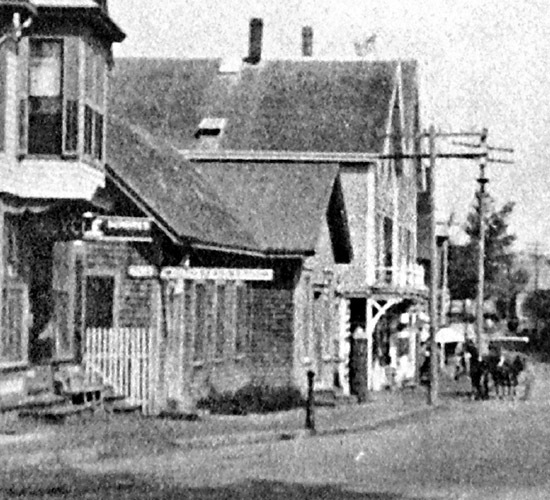 According to the Gazette, Downs moved to Vineyard Haven to take over the Bradley Harness Shop upon Sylvester Bradley's death in May 1900 (see Site #23.) According to one article, he kept about 25 horses for hire when he first came to town. He was known for his story-telling. The 1907 directory of Vineyard Haven lists Bradley as a "harness maker" on Main street near Centre. He appears in the 1910 Tisbury census as a 61-year-old harness maker and repairer, and again in the 1920 census as a "harness maker." 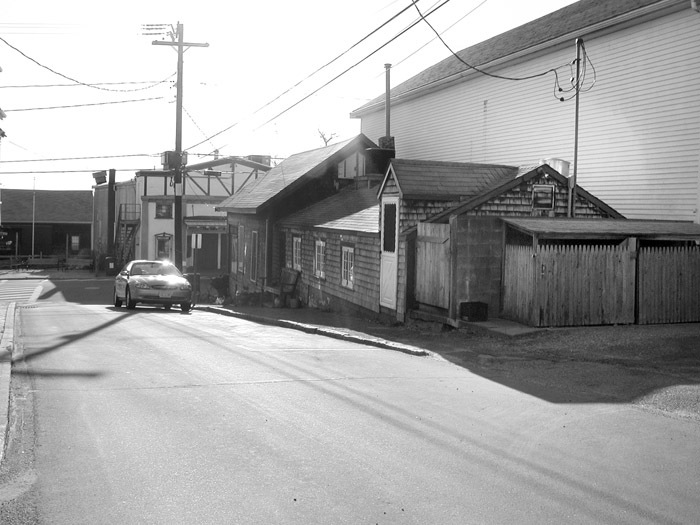 In November 1927 he moved his shop across Main Street into a corner of Norton's stable (see Site #10.) By this time Frank Downs was the only harness maker on Martha's Vineyard. Ornan J. Slocum, brother of the well-known sailor-adventurer-author Joshua Slocum, is remembered to have had a shoe shop at this location, although the dates aren't known precisely. The 1907 Vineyard Haven directory lists Ornan J. Slocum as a Main street shoemaker, and the 1910 census lists Ornan J. Slocum, aged 58, with his own cobbler shop. 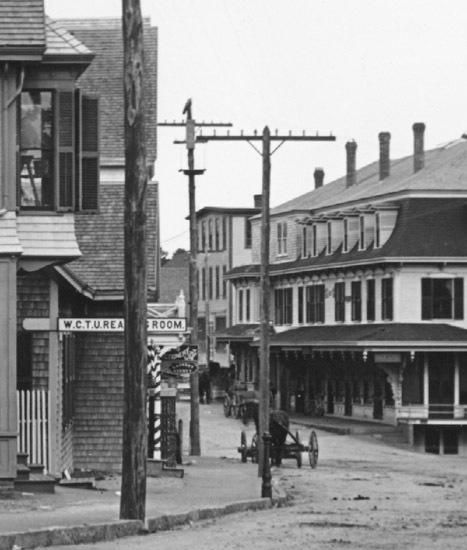 The 1910 Vineyard Haven directory lists Slocum as a Main street shoemaker. The 1914 Sanborn map marks a "Cobbler" at this location, which Stan Lair identified as being Slocum's shop. One retrospective newspaper clipping referred to it as "O. J. Slocum's shoe repairing cubicle." 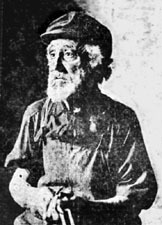 In September 1915 Slocum accepted a position as the janitor of the Tisbury School on Centre street, a position he retained until at least 1920. 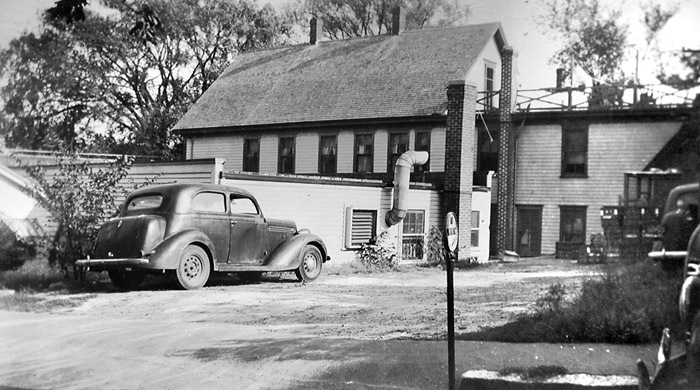 By early 1926 it was reported that Slocum and his wife were wintering in Natick, and in May 1926 that Slocum's diner was being put in order for the summer. Stan Lair said: "Now, Ornan Slocum. He was the brother of Joshua Slocum, the man who sailed around the world. Ornan at one time was a custodian of the old Centre Street School, up on Center Street. He also at one time ran a trolley lunch wagon, located right across that little alley from the theater, parallel to that little lane there, and he had one of the old trolley cars converted into a lunch wagon. Didn't last too long. He also repaired shoes, at another time, across the street. The little place there. Had a little shoe repairing business. And he used to live right in back of us when we lived on Centre Street, lived in the house that Trebby lives in now." According to a 1930 Gazette article, Slocum was born on Briar Island in the Bay of Fundy, Canada, the son of a cooper. At age fourteen he went to gold diggings in Lunenberg, and later worked on Dutch fishing boats catching cod off Labrador. He learned the trade of tanning and shoemaking in Bridgewater, Nova Scotia. In 1869 he moved to the United States, first in Natick, making shoes. He moved to Florida for a period to treat his rheumatism and worked in the orange groves before starting a alligator skin business. He also served as a marshall in Orange Park City for a period. By August 1920, and in 1921, Francis Elliot Chase (1854-1930) was advertising shoe repairing at Downs Harness Shop. According to a 1926 Gazette article, Chase was "not only a veritable jack of all trades, but an artist of no mean ability as well." He was born in Menemsha Creek in 1854, the son of Chilmark carpenter George Chase and his wife Celia. At age fourteen he moved to what was later known as Seven Gates Farm. 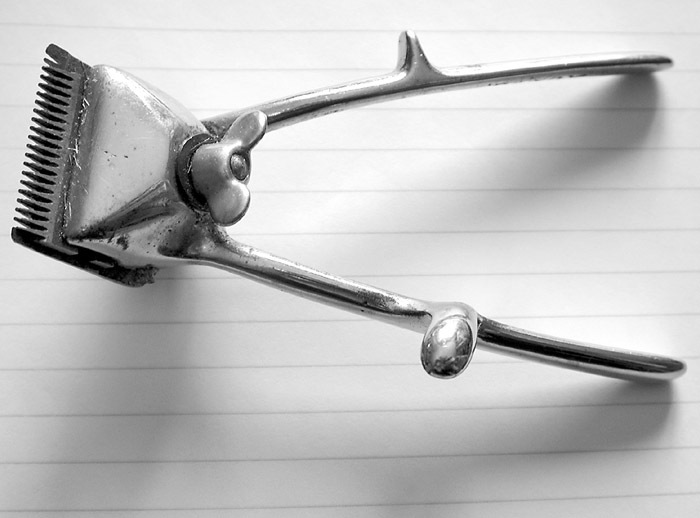 He worked as a blacksmith for a number years, then in fishing and coasting. He moved to New Bedford and worked there as a carpenter for five years, then in Cambridge for five years, then in Revere for eighteen years. He then took up the occupation of sign-painter, and later became a painter of marine pictures, flowers, and portraits (which he continued to do until the end of his life.) In 1926 he was still working as a shoemaker. RL: Grandpa Downs, To... not Todd Chase but Frank Chase. RL: No, Frank Chase. Worked for Grandpa Downs. SL: Oh, Frank Chase, yeah! That's right. RL: Sure, well, he played a Stradivarius. He was a violinist. He was a very smart man! SL: I know he played in the town band, too. Played clarinet, I think. RL: And his wife was a very... well, she was an actress. She had hair right to the floor. SL: I know, I remember. RL: Very attractive woman. And Grandpa Downs, I can see him in there now, sittin' there with that harness. It was pretty good stuff. And then it was Roger Amidon, in the same block. SL: What was he doin', radio work? RL: Radio. Freed-Eisemann. I worked for him. We were up island once... Roger was smart. Very capable mechanically and otherwise. He had a good head. And we had a problem, see, we couldn't get the voice through good. So h said "you wanna see something, Ralph." I says "What's that, Roger?" He says "take that antenna right off the roof." We took it off the roof, you know what we did with it? We buried it. And the nicest tone, nicest voices you ever heard, just as clear as a bell, beautiful. The man knew his business! SL: Yes, he was smart. RL: He was smart! But gettin' back to Roger again, see, That Freed-Eisemann was on the biggest liners in the world. 'Twas a lovely set. And Roger sold, disposed of a good many, here. He really did. SL: That was before the First National went in there, right? RL: Yes. That First National Billy Andrews had built, and rented it to the First National. They never would buy. Which is now the book store. Stan Lair recalled a "Portuguese Club" in the back room. In an August 1926 Gazette it was reported that "The Portuguese Club, `Sacadura-Cabral,' have a beautiful large flag in their club hall on the Main street." Presumably this is the same club that was at this site. 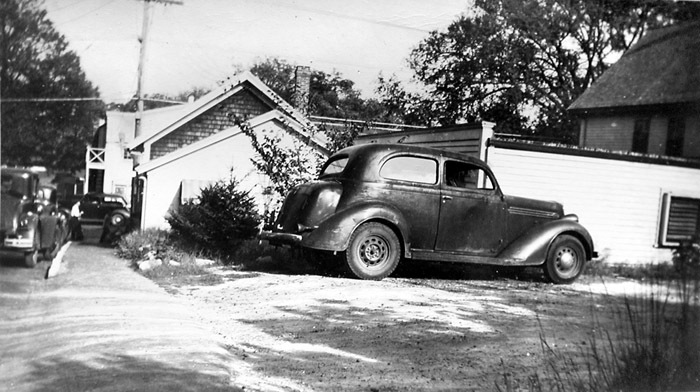 Roger Amidon in 1922, when he worked for Dukes County Garage. Stan Lair said: "[This] was the First National store, and then it was demolished. The present building was a modern First National store. It is now the Bunch of Grapes Bookstore, and I noticed they've put a second story on there, so that changes the whole front of that building. Seamond Roberts writes: "The First National. Well, before the A&P moved to the lower location when it became a super store, the First National was more of a supermarket than A&P or SBS or Bangs' (which never was a super store, was always a specialty store catering to the rich bucks in the summer time). The First National always had bins of beautifully arranged fruits and vegetables outside and made that area smell so nice, especially when they had muskmellons for sale. I don't remember the people in there, but I do remember the big red sign outside FIRST NATIONAL STORES, very impressive and reminded me of the BEN FRANKLIN sign so much I wondered as a kid if they were not the same company. (See how you think `things' when you are a kid.) I remember we would park in the parking lot behind the store and they grocery boys would carry our bags up to our car there which we thought was very nice and mother would want to tip them, but most of the time they were really afraid to take the tip as they were told not to do it. Mother said that she liked the way they packed our groceries `better than any store she had ever seen.' I think their yellow apples were the biggest I ever saw - in my memory they are huge and the flavor still to this day unmatched. At Christmas, we used to get our ribbon candy from First National and we would get one box for at home for eating and many other boxes as gifts to friends on the island. Unlike fruit cake, while everyone seemed to give and get ribbon candy, it seemed it was always a welcomed `thinking of you' present. You could get a `heavier duty' version of it too and I remember during the Korean War, we got some and shipped it to `one of the boys' over in Korea and he wrote us he was amazed that it had survived intact. So was the manager of First National when Mom told him! So, you see to me First National there in Vineyard Haven is a yummy memory, associated with many good foods, flavors and good service that we got from them too." John Canha writes: "The first national store, which I would enter every other day after school, buy groceries for my mom. Ed Lopes was one of the managers until he was sent to Edgartown to run a First National Store there (he died suddenly while still manager off the Edgartown store.) Next to First National Store was A. S. Andrews' Barber Shop, also run by son Billy after A. S.' sudden death. This shop was on the corner of Center and Main. (Yes, I got my monthly hair cuts there. Billy and his people were good barbers.)" The First National Store. Bill Andrews (left rear), Frank Lopes, and manager Leo Pepin (center.) If Sept. 4 fell on a Sunday (note the Tivoli poster), then this was probably taken in 1932 or 1938. In 1929 the Gazette reported that an addition was made to Andrews' Block. It's unclear when the First National first moved into this building, but in 1932 it was reported that "The First National Store stock and fixtures were removed from the Andrews Block to the Red Men's building preparatory to the razing and rebuilding of the section which is to contain the new market." William H. "Billy" Andrews is credited for tearing down the old south end of this building and constructing the modern building at this time. 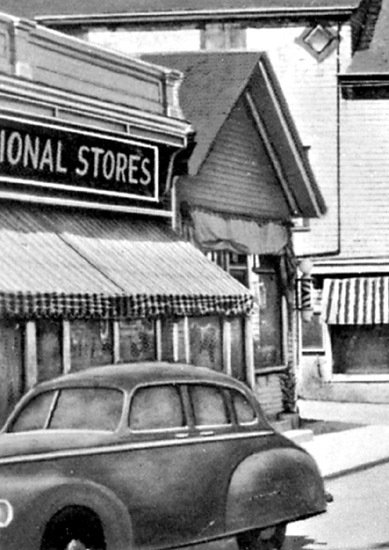 In July 1932 the First National Store signed a new one-year lease with owner William Andrews. According to the lease, after alterations the store's interior was to measure 33 by 75 feet. Rent was $100 per month. 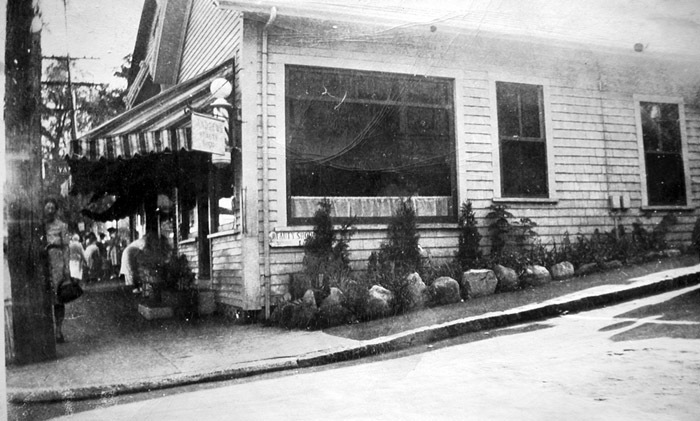 The First National company also leased a store in Oak Bluffs in 1930, and another in Edgartown in 1934. 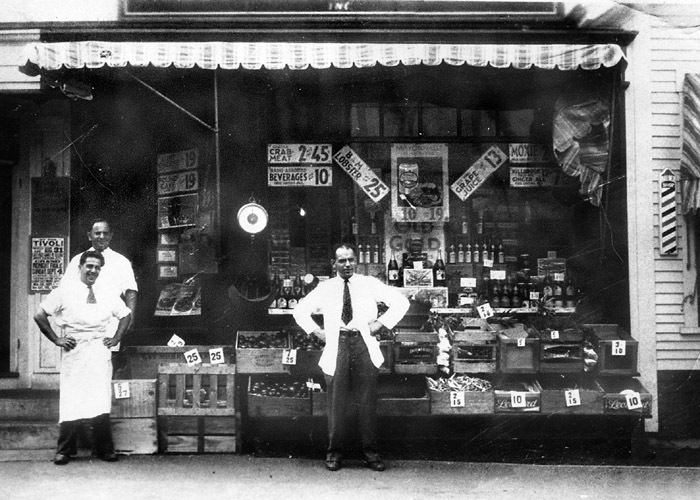 Employees at the First National Store included Leo Pepin (manager), Fred Rudolph (meat manager), George Alley, Frank Lopes, and Joe Borges, as well as Lou Hathaway, "Red" Dolby and Howard Andrews. 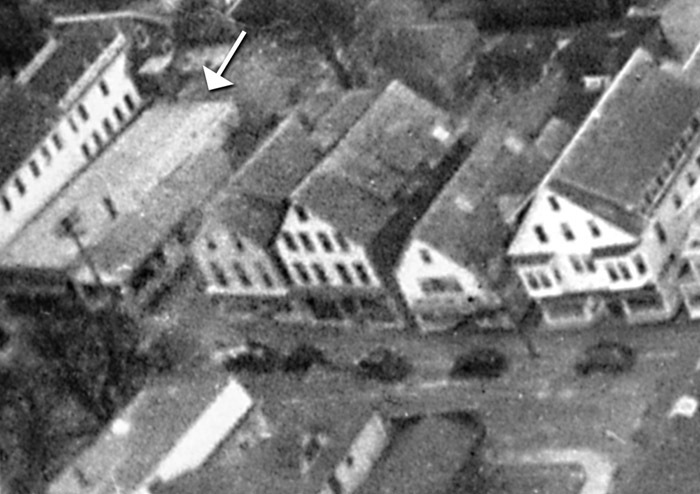 This 1947 aerial photo shows the First National Store as a one-story rectangular building. Photo by pilot Walter Hume Renear. HA: Then they got itinerant people to come in and help out. JA: Like you, right? Did you say that they used to get things in great big barrels and sacks and you'd have to go down and make them into smaller? HA: Yeah, but I was just a grunt. I wasn't one of the ones that I marveled at.When you'd get your groceries, instead of standing there in front of the clerk and have them go on the computer, it was all written on the back of a bag. Big order, big bag. JA: Well, they had a cash register, but all it did was ring up how much it was. JA: But they used to add up the order on the bag, I remember that. HA: I wonder how many people could do that today? Bob Iadicicco adds: "Connie [Frank]'s brother-in-law, Joe Borges (Florence's husband) was produce manager at First National, also after they moved to Post Office corner; and subsequently when it became an IGA. Employees were George Cournoyer, Joe Fragosa, Frank Lopes; Meat Manager was Mr. Rudolph. Also two Lopes sisters worked on groceries. Grocery Counter on left, on right was produce, followed by Meat Counter. Customers called out items and they ran around pulling them off shelves. Prices were written on brown paper bag; added by hand. Sounds much like the Phila. `American Stores'; chain of corner stores that were forerunner of Acme Supermarkets. They gave credit- weekly tabs." There was a conveyor chute in the sidewalk leading to a full basement under the First National store, through which deliveries were loaded. Howard Andrews said: "When they came in they'd lift up that plate in the sidewalk and throw it all down the chute, and somebody down below would move it out of the way until they'd get their whole order. A lot of stuff used to come in what they'd call `tea boxes.' They're very thin plywood and they may have been three by three, and they'd put cigarettes, and If it was stuff in case lots, you'd get the cases. But something they only had six of, or whatever, they'd put them all in tea boxes. And they would generally come in the back of the store." First National and Andrews' Barber Shop, as seen in a detail from a post card. Rear view of the First National Building and Tilton's Drug Store from Centre Street. In May 1956 it was reported in the Gazette that half of the Andrews Block had been rented by Billy Andrews' widow to Mrs. Ida S. Swartz of Vineyard Haven, Mrs. Mary S. Burgess formerly of Taunton, and Mrs. Susan F. Amaral of Vineyard Haven. The three partners were announcing their plans to open a snack bar in the building, opening in June 1956. A five year lease was signed on the northern half of the building, and the work of partitioning it off had begun. In July 1956 town records note that this group were operating a bakery and luncheonette under the name of "Snack-Bar." Howard Andrews remembers that the wives of Billy Swartz, Arthur Andrews, and Fred Sherwood had a restaurant in the north side of building, next to barber shop, for a number of years. After the First National Store moved to Five Corners, Francis Medeiros opened a shoe store on the south side of the building. By 1965 the Bunch of Grapes Bookstore was advertising in the Gazette. In 1975 Stephanie and David Hugo deeded this property to Ann and Jon Nelson. In the early 1980s(? ), Ann Nelson added a second story to her bookstore. The barber shop and adjoined stores, c. 1917-18. The two stars over the door denote A. S. Andrews' two boys (Hollis and Bill) in the service. Polly of the Circus was a 1917 film. 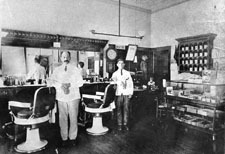 Stan Lair said: "[This] was the barber shop, operated by a Mr. Medeiros. And then A. S. Andrews, and Mr. Andrews had a typewriter rental shop in the rear of this barber shop. It was then operated by his son, William Andrews, Billy Andrews. At one time there was a women's hairdressing shop in the rear, Priscilla's. It is now Popeye's Deli." It's unclear where all of the early barber shops were located. William Hammond rebuilt and reopened his destroyed barber shop in December 1883 (see Site #20), and in November 1883 the Gazette reported a rumor of "another" barber shop to be opened. By August 1884 the Gazette noted that there were two barbers in town, one of which was Mr. Hammond. What was the other? 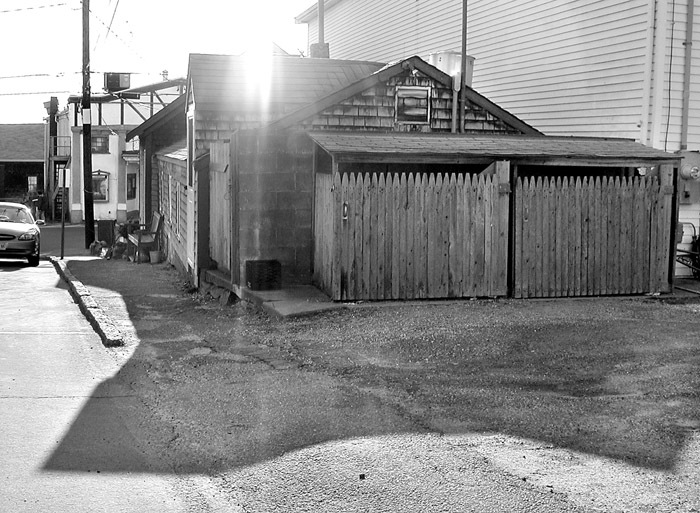 The first barber shop at this location is known to have been conducted by a Mr. Pimental of Oak Bluffs. In September 1890 the Gazette reported that "Mr. Parmentar, a tonsorial artist from Cottage City, is now located in the store corner of Main and Centre streets, his family occupying thee apartments of Mr. J. Lambert over the Boston Store." Joseph (Jose M. ) Pimental, (1868 1893) was born in Sao Miguel in the Azores, the son of Manuel and Mary Pimental. 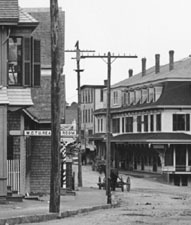 He was called a New Bedford barber in 1890 when he married Mary Frances AKA Marianna Francisca, the daughter of Manuel and Maria Francisca of Cottage City. In 1892 and 1893 records he was called a Tisbury barber. In October 1892, the Gazette reported that Mr. F. S. Correa and family "arrived and will occupy the tenement in Lambert's block. Mr. Correa is a barber and will occupy the store vacated by Mr. Pimental." He evidently did not remain the barber here long. It's unclear who this barber was, although it may have been Henrique Correira AKA Henry Corey (c.1858-9 - ____), the son of José Coreia and Nareiza/Narciza Rosa/Roza, who emigrated from Fayal to Cottage City by 1880, when he married Capitolina Encarnaco P. Medeiros (1861-1922), the daughter of Manuel Pacheco Medeiros and Innocencia Rosa Ferreira. He was listed as a Cottage City barber in 1880, and a Cottage City day laborer in 1900. The next barber here was Raul Balthazar (de)Medeiros (1866-1918), who was born in Povoacão, San Miguel, the Azores, the son of Joseph F. Medeiros. 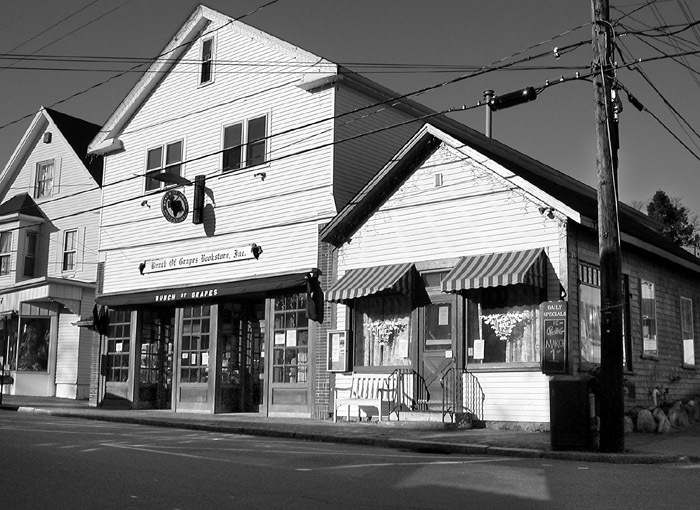 He arrived in Boston on the steamship Azorean in 1883, and was listed as a "hairdresser" in this corner shop in 1897 and 1907, and the 1900 census lists him as a Vineyard Haven "barber." Medeiros was occupying this building in October 1903, when the fire on the roof during a gale caused a scare. 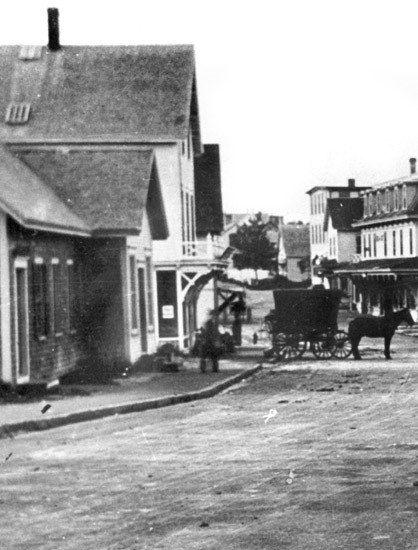 The 1910 Tisbury census lists him as an odd jobs laborer living on Franklin Street. He was married to Elvira Amaral (18711924) about 1892. Stan Lair: "[A. S. Andrews] ran the original barber shop there. And he had a little place in the back where he rented out typewriters. I think he was justice of the peace, too. He operated there for a long time, and finally of course Billy took over." In June 1910, Joseph A. and Dolphine S. Merry sold this property to A. S. Andrews. Antone Silva Andrews (c.1871-2 - 1927) was born on the island of Fayal in the Azores and came to the United States at the age of seventeen with no English, no money, and little education. He worked for a few years on a Nevada ranch and later worked as a barber in San Francisco. (Antone had worked as a barber in the Azores as well.) According to his obituary, he came to the Vineyard in 1895 and opened a barber shop in Vineyard Haven the same year, which he conducted until 1920 when his health forced him to retire. He educated himself in both English and Portuguese and was sought out by island Portuguese people who needed advice. One Gazette article noted "It is said that he speaks the purest and most cultured Portuguese of any person on Martha's Vineyard." He also ran a job printing office (in both languages) in addition to his barber shop. He was a notary public from about 1913 until his death. He maintained his job printing business until after 1926. 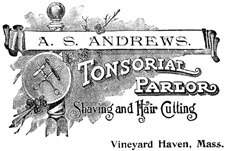 The 1910 Vineyard Haven directory lists him as a Main Street "hairdresser" (his predecessor, Raul Medeiros, was listed with no occupation in the same directory) and the April 1910 census lists Andrews, aged 37, as the owner of his own barber shop. His son William Andrews, aged thirteen, is listed as a barber shop apprentice. 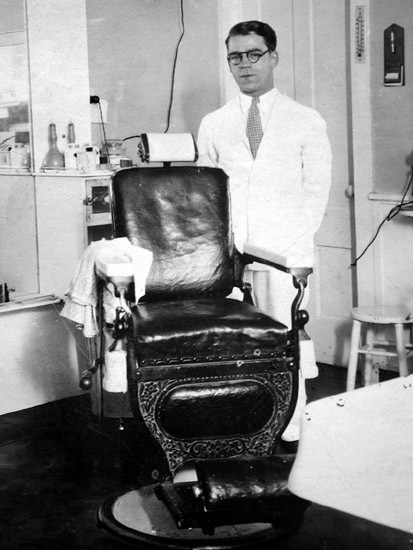 In August 1917, Raul B. Medeiros Jr. of Tisbury deeded to Antone S. Andrews three barber chairs, two mirrors, electric light fixtures, four chairs, a hot and cold pressure tank, one clock, one copper boiler, one blue-flame oil stove, three cuspidors, an oil can, and an oil stove, as well the lease to the barber shop. The 1920 Census lists Antone S. Andrews as a barber, and his son William H. Andrews as the "assistant barber." Andrews also advertised himself as a dealer of sewing machines in the 1920 papers. In 1922 and 1923 he advertised Singer Sewing Machines (as well as belts, needles, and oil) and in 1925 he was selling typewriters. Stan Lair wrote on the back of this photo: "A. S. Andrews with mustache, other unknown. Note the shaving mugs in the rack. Several customers had their own mug." 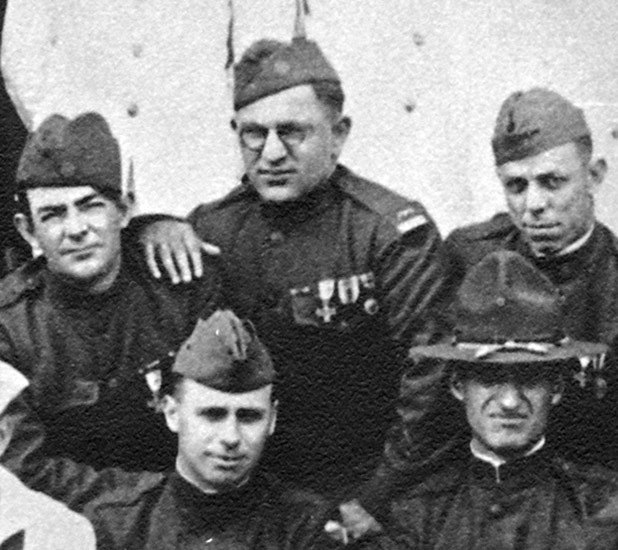 Bill Andrews, "Tisbury's tonsorial champion"
Billy Andrews (center) with fellow WWI veterans Robert Cromwell (left), Ted Howes (right), Herbert Norton (bottom left) and Edward Duarte (bottom right). 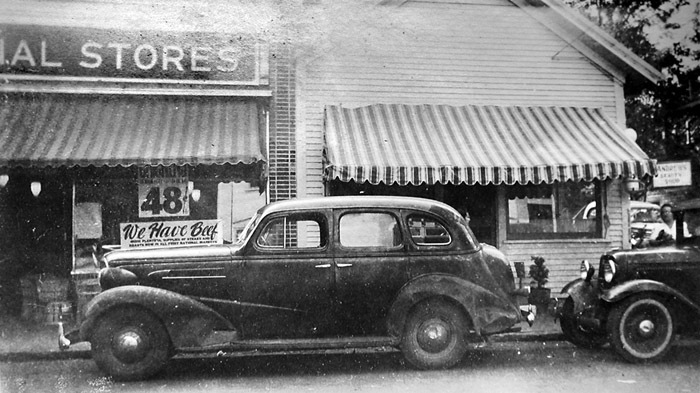 A. S. Andrews retired about 1920, and his son William H. "Billy" Andrews took over the shop. 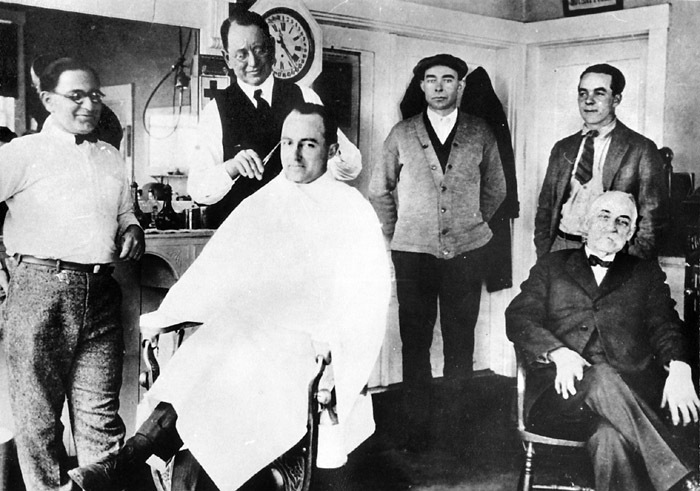 In 1920-21 he advertised himself as a barber, but also sold tobacco and cigars. Stan Lair said: "Let's see. Billy Andrews. He was right on the corner there. He had a barber shop. His father before him, Antone Andrews, also had a shop there, and Billy inherited it. Billy also played for dancing - he played piano. Played Saturday nights at West Chop Casino for quite a few years. Also played at the Chilmark Tavern, and various other places. It was just a small orchestra, about three pieces, sax, drum, and piano. They played with him, and had a lot of good times." BW: Billy lived right near us, the corner of the Edgartown Road and Skiff Avenue. And had the barber shop on Main Street that's in where Popeye's Restaurant is now, right next to the Bunch of Grapes Bookstore. Billy cut hair there for a good many years, I guess. He also used to do auctioning, too. Didn't he? Wasn't he an auctioneer? SL: Yes, and he also played piano for dancing. I played with him for a good many years. Three or four piece band, and we played all over the place, West Chop and Edgartown up over the what do they call it there on Main Street? The telephone office used to be up there. Red Men's Hall was it? SL: Played there quite a few times. 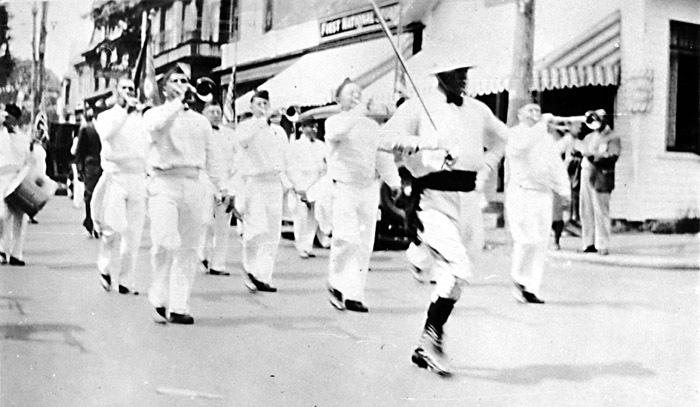 The Legion Bugle and Drum Corps marching by the First National Store and W. H. Andrews' Barber Shop, 1926. 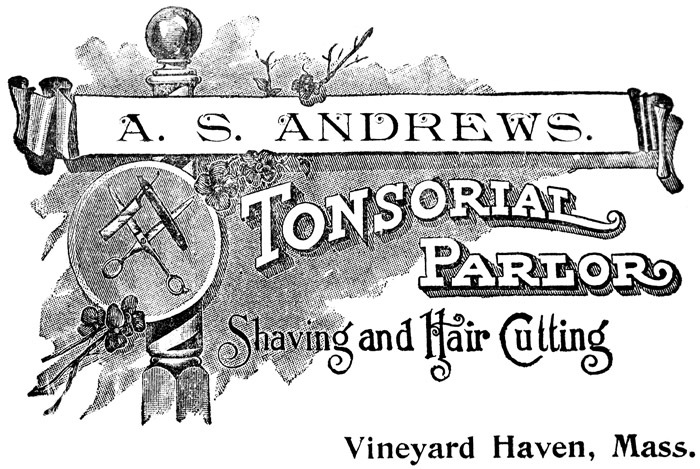 Barber William H. Andrews (1896 - 1951) was born in Vineyard Haven, the son of Antone Silva Andrews and Mary E. Silvia. According to his obituary he went to school in both Oak Bluffs and Vineyard Haven, and began barber training at age thirteen. He worked briefly in New Bedford, and served in Europe during World War I, but otherwise lived in Vineyard Haven. The paper adds, "He built the Andrews Block which housed his own and other Main street establishments," referring to the rebuilt south end of Dexter's original building. In December 1927 the property was deeded to William H Andrews from the estate of his father Antone S. Andrews, who had died that year. In May 1926 the Gazette reported that William Furnan was returning to his duties at the shop of William Andrews after wintering in East Boston. In May 1932, Oscar Mesquita (1889 - ? ; AKA "Jack Sylvia") of Oak Bluffs was the new barber on staff. In July 1935 it was reported that George Sousa was employed by Andrews as a barber. In February 1928, the paper made a reference to the late A. S. Andrews' old printing office, "now William Andrews' two establishments in one." In March 1928 Bill Andrews put a new "plate glass front" on his shop. In April 1932 there was a fire on the roof of the barber shop, causing minor damage. In October 1935 the Gazette reported that "Extensive alterations and remodeling, involving a large expenditure, is taking place in the business establishment of William H Andrews. The entire place is being enlarged and reequipped." Stan Lair wrote on this photo: "William G. Manter poses as the barber. Winslow West is the customer. Bill Andrews (the barber) (standing at the left with an amused grin.) Joe Allen in right center background with Dean Swift. S. C. Luce Sr. in the chair right foreground." Howard Andrews (son of barber Bill Andrews) said: "My father could speak and write Portuguese. And this fellow came in and brought in a piece of paper, a promissory note, and he says `Bill, Carey Luce says if you'll sign this piece of paper, he'll give me a hundred dollars.' My father says, `I tell you what. You take it back, tell Mr. Luce to sign it, I'll give you the hundred.' Another one they used to talk about - people going into my father's barber shop would always say that `Carey Luce doesn't cut any hair, and [Andrews] doesn't lend any money.'" In January 1934 the paper reported that William H. Andrews was president of the newly organized Portuguese-American Civic League, which at that time had just published the first ever Portuguese-language notice in the Gazette. It was an invitation to attend the first meeting of the league. 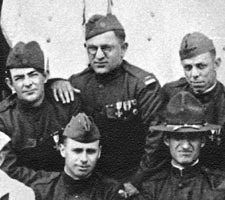 He remained president until 1935, and by this time he was also a past commander of General George W. Goethals Post of the American Legion, and was a former sealer of weights and measures. In 1922 he had also served as a constable, substituted as night watchman during an illness of George Dolby. In February 1935 the Gazette reported checker games in the back room of Bill Andrews' barber shop. Hair cuts were fifty cents, a shave, twenty. According to Howard Andrews, around World War II "they stopped giving shaves. But they would to preferential customers. Like Carey Luce would come in and he'd give them a chance to run the razor around his throat, a straight razor, and fantasize while they were doing it." In August 1946 it was reported that Walter Sherwood was working as a barber at Andrews Barber Shop. Sherwood later perhaps around the time of Bill Andrews' retirement about 1949 rented the shop for a period. 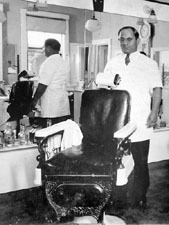 Although Andrews retired from the barber shop about 1949, he continued to retain ownership of Andrews Beauty Parlor operated in connection with the barber shop. Seamond Roberts writes: "My father used to get his hair cut at Andrew's Barber Shop and he loved to go in there and just listen. Bill Andrews was a wealth of stories - like most barbers. At the time, there were lots of Vineyard Haven folks that were old timers who told sea yarns while waiting or being cut on and Dad would usually come back to the car with his latest local lore story. Oh, if you had been around then with a tape recorder. Unfortunately, I can't remember any of them. But I think Dad enjoyed the stories probably better than the haircuts." Rear view of Andrews' Block. Similar views of Cafe Moxie, March 2001. 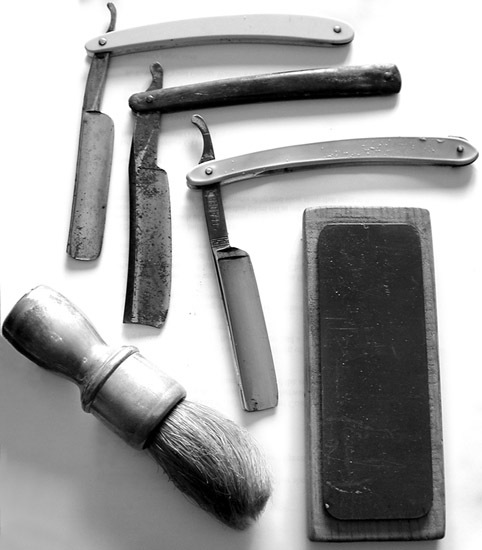 Some of Bill Andrews' barbering tools. From the collection of Howard Andrews. 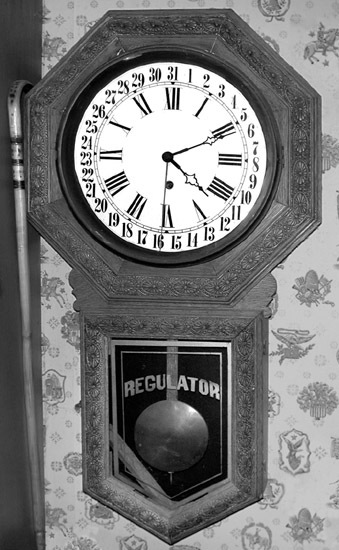 The old oak "Register" wind-up barber shop clock, carefully restored by Howard Andrews, now hangs in his kitchen. The old barber pole was thrown away years ago, and the barber chair was given away. Howard Andrews said of the pole "I think my father had it holding up something in the garage." In April 1927 the Gazette reported that the Priscilla Beauty Shop was open for the season, with Miss Priscilla Luce in charge, at the barber shop of W. H. Andrews. 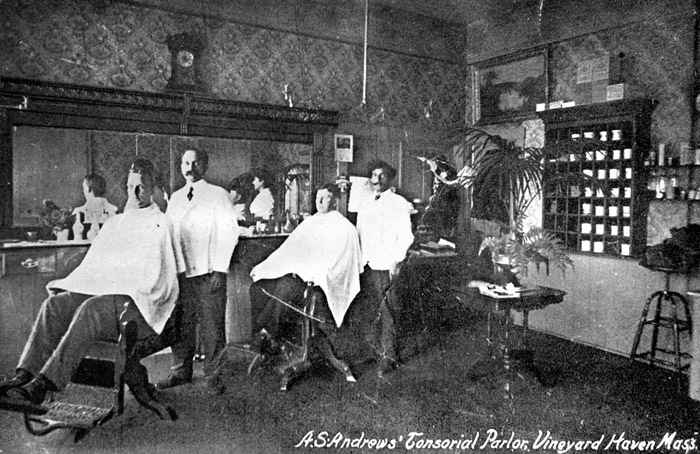 In August 1927, the Gazette reported that "The barber shop of Bill Andrews, once the refuge of unattached menfolk, is rapidly developing into a beauty parlor." In 1930, the Martha's Vineyard Beauty Shoppe was advertising opposite the Vineyard Haven Theatre. Gladys Paltz was listed as the beautician. In June 1934 the Martha's Vineyard Beauty Shop opened for the season, offering "shampooing, facial and scalp treatment," Gladys Baptiste Wooley, Beautician. In September 1934 "Anthony" was now managing the Martha's Vineyard Beauty Shoppe (located on Main Street opposite the theatre with its entrance on Center street.) "Anthony" had previously worked for Penny's Beauty Salon on Circuit Ave. in Oak Bluffs. In April 1935 the Martha's Vineyard Beauty Shoppe reopened under the management of Madge Bennallack, a Wilfred Academy Graduate. In December 1935 the Gazette reported that alterations had been completed in Andrews barber shop and beauty salon, "resulting in the enlarging of the establishment through the elimination of the office that formerly occupied a room between the two departments." In May 1936, Miss Carrie Parker of Fall River operated Andrews Beauty Shop. In May 1937 Ellen Hamre was the manager. In May 1940 the Andrews Beauty Shop opened with Marguerite Reilly of New York in charge. By June 1945 Elizabeth Rogers managed the beauty shop. Marion Woods was also remembered as working here. George F. Souza (c.1910-11 1960?) was born in Fall River. He worked for Andrews as early as 1940, and managed the shop for a couple of years after Bill Andrews died. In February 1953 the barber shop in Andrews Block closed for good following the removal of the beauty shop in the rear, and Sousa's removal to Dan Alisio's barber shop down the street (see Site #3.) By 1960 Souza had gone to work at Bert's Barber Shop. He died that year of a heart attack at the age of 49. BW: George the barber? Well I remember George. Well he worked for Dan Alisio's barber shop, he worked for Billy Andrews, he had three or four barber shops of his own. Moved around. And I guess he left the island a couple of times, and came back. SL: He always kept a little bottle out in the back room somewhere. SL: I followed George right around, when he worked at Billy Andrews I was with him, and the last place he had was in Oak Bluffs and I had my hair cut over there until he finally left the island, I guess. I don't know what ever happened to him. In February 1953 the "entire shop" was leased by Bill Andrews' widow Mrs. Edna J. Andrews to Mr. and Mrs. Paul E. Trahan who announced their plans to combine both shops and open a candy kitchen and store. By May 1953 Trahan's Candy Kitchen was advertising in the newspaper. After the Trahan's closed their store in the 1970s, they opened a candy store in Falmouth, and eventually moved to Florida, where they also opened a store. The Linden Tree c. 198_? Since 199_ this building has been occupied by Café Moxie, owned by Tina Miller. Stan Lair said: "Then comes Center Street. In the old days, there was a full wet river after a rainstorm. Boy the water would really come down that street, just like a river! It was impossible to get across without getting your feet wet right up to your ankles unless you wore rubber boots or something like that. They finally had a wooden bridge made that the Highway Department would throw across the street after a rainstorm. And now they have an underground drainage system, of course, so all is well." In March 1934 a plank bridge was built, extending from sidewalk to sidewalk at the intersection of Centre and Main streets. According to a Gazette article, the bridge was idea of tailor William Beatty, and the idea was acted upon by selectman Thomas Rabbitt. Howard Andrews said: "When you stepped out there before they had that bridge, you got water up to your knees. It was bad you were going to get a good soaking." Installing the storm drains at the bottom of Center Street which finally made the Centre Street bridge unnecessary. Photo courtesy Howard Andrews.